The key at the bottom of the page corresponds to this list. 1. Brandywine, an heirloom beefsteak purported to have been in Burpee’s catalog in the 1880s before disappearing for some years. Returned to circulation when Doris Sudduth Hill of Ohio gave some seeds to Seed Savers Exchange in 1982. Giant leaves shade slow ripening, pinkish fruit that are sometime ridiculously large. Average yield at best but among highest rated in flavor. 2. Rutgers- Developed by Rutgers University for the canning industry in the 1950s. Orange to red color, round with thick pulp as favored for canning. I have these because I was in a jam when the weather stunted off several of my starts this spring and I stumbled across these at a friend’s seed& feed store. 3. Cherokee Purple, an heirloom that was purported to have been given to the ancestors of John green of Eastern Tennessee by the Cherokees in the 1800s. 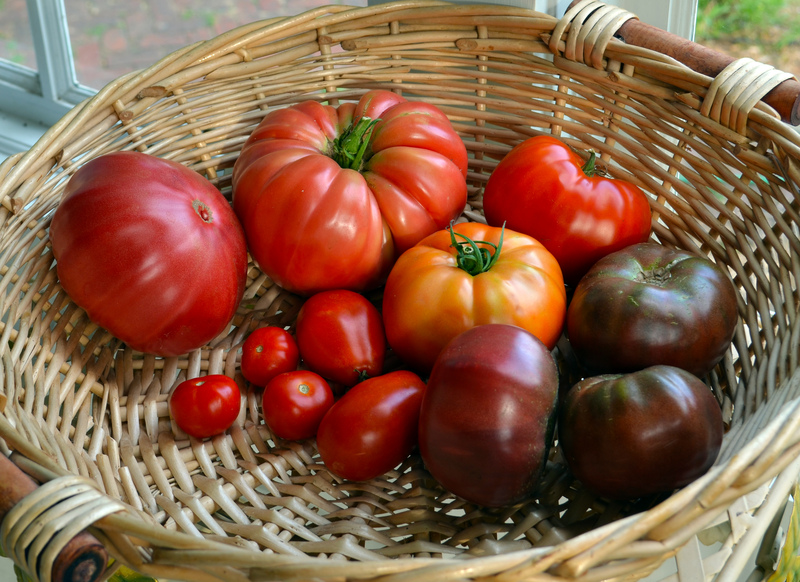 In 1990 Green sent some seeds unsolicited to Craig LeHoullier of Pennsylvania, who was impressed by the true “purple” color of this beefsteak type tomato. The kicker was this one tasted very good too, unlike some others purple types available at the time. The nest year both Southern Exposure Seed Exchange and Seed Savers Exchange offered these and their popularity grew with home gardeners and small market growers. Personally, this is my favorite tomato ever; it is a beautiful color inside and out and maintains an odd green shoulder that camouflages the ripeness of the tomato. 4. Roma VF- High yielding determinate bush variety that was commercially developed in the 1950s in Maryland. Even though it isn’t an heirloom, it is open pollinated and seeds saved from one year to the next are generally true to the parent. A basic pulp tomato, good for soups, sauces and salsa. My experience is each bush will yield anywhere from 80 to 150 tomatoes. Disease resistant, hard to kill, what’s not to like? 5. Tommy Toe heirloom cherry tomato from the Ozark mountains. Prolific, both in yield and self seeding year over year. Plant once, have them for life. 😉 Flavor is terrific for a cherry and is good grilled, sauteed, raw or in juice or sauces or any tomato dish. Eat these warm, straight from the vine when it is 90 degrees outside, you will like them. I’ll take one of each. Make it 4 of each, that picture is making me hungry! I grew Rutgers Red this year. From Penny’s Tomatoes (Affiliated with Pepper Joes) :My choice for dark tomatoes was “Black Sea Man” from Seed Savers. A rather rude name for a tomato when said rapidly…. Haha I searched for Pepper Joe/ Penny’s Tomatoes and saw the picture you sent them of a plant germinated from 7 year old seed. I didn’t realize they were way down here in the south too. FINALLY. Can I have some on Sunday? I’m a big fan of the Cherokee Purple. Alas I have not gotten a single one to harvest this year. Even though I started at least 30 tomato plants from seed this year (plus tons of other stuff), watering their little cubes every day like a dutiful garden slave, transplanting all of them into hugel wood core beds I dug and filled by hand, inside the 100’x50′ deer fence I built 9 feet tall…..
Friggin deer still got in and mowed everything the very first night. On the bright side, I’m great at growing deer food. And I now have an electric fence. Fortunately I am about the only gardener in nw ga who has had deer damage. Fantastic selection. Those purple ones look great. I grew Black Russian a few times…looks just the same. If they are as good as them they will be delicious. They are, believe me. The Cherokee purple are winning the productivity contest this season and we are no complaining. Your purples finished off considerably darker than mine. Also, even the best ones I’ve produced are a lot more beat up looking. The flavor must be similar though, as this is my first year with them and they are my favorite as well.